Are dioxins responsible for eel declines? Palstra, AP, VJT van Ginneken, AJ Murk, GEEJM van den Thillart. 2006. Are dioxin-like contaminants responsible for eel (Anguilla anguilla) drama? Naturwissenschaften, in press. Why have eels declined precipitously since the 1980s? Laboratory experiments with eels reveal that the survival time of embryos are highly sensitive to low levels of PCBs and dioxins. The larvae develop defects that are typical for PCB-exposed eggs in other fish. Most eels in Europe carry contamination levels that are above those sufficient to cause severe damage in this study. Hence it would appear that dioxin-like contaminants have contributed to the precipitous decline in eel numbers that have occurred since the 1980s. What did they do? Palstra et al. used a newly developed technique that allows scientists to study embryonic development of eels in the lab. This was not possibly until recently, until tools were developed for artificial insemination of eels. The new technique involves hormonal manipulations of both males and females, after which eggs and sperm are collected. The fertilized eggs are then reared in artificial seawater for as long as development proceeds. Palstra et al. tracked embryonic development of artificially-fertilized eggs, while also obtaining information about PCB and dioxin contamination in each female from which eggs were obtained. The contamination load was estimated using a gene assay that was specific for dioxin-like contamination, measured as dioxin-equivalents, or TEQs. Prior studies have shown that in eels, PCBs constitute most of the total contamination measured as TEQ. 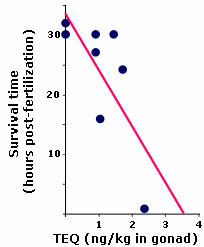 Higher TEQ levels were associated with dramatically-shortened survival times of embryos. At higher contaminant levels, embryo damage was observed, including edemas of the yolksac, deformed heads, and no heartbeat. These deformities are common in fish exposed to dioxins. What does it mean? Palstra et al. demonstrate that eel embryo survival is highly sensitive to dioxin-like contamination. The levels are well within the range to which most European eels are exposed. Palstra et al. conclude that it is "likely that dioxin-like PCBs contributed to the current collapse of the European eel population. Their findings suggest that the story of the eel collapse will be similar to that of lake trout in the US Great Lakes. The collapse this fishery had long been attributed to over-fishing and parasitism. Recent work combining laboratory studies of dioxin impacts, field observations and computer simulations has strongly implicated dioxin contamination.